From deaths to damages, auto industry to oil refineries. Here's the latest on Hurricane Harvey 2017. Hurricane Harvey has devastated the area surrounding Houston, the nation's fourth-largest city, with catastrophic, record-setting flooding. The storm has taken the lives of 60 people in 11 counties, with roughly half of the fatalities in Houston's Harris County. Beyond the human devastation, Harvey has wreaked havoc on business in the heartland of U.S. oil production. Harvey will have lasting impacts on the economic landscape of the nation, burdening oil services companies, insurers and automakers. Here's a running list of damage estimates since Hurricane Harvey hit one week ago. In terms of overall damage, Harvey could rank among the top costliest storms to hit the country. Superstorm Sandy in 2012 cost $73 billion in today's dollars, ranking second-most-costly behind Hurricane Katrina in 2005, which cost a massive $118 billion. Moody's said total losses from Hurricane Harvey will come in between $45 billion and $65 billion, with overall U.S. economic losses between $6 billion and $10 billion. Enki Research suggested between $48 billion and $75 billion in total losses. JPMorgan analysts said Harvey would rack up about $10 billion to $20 billion in insured losses. 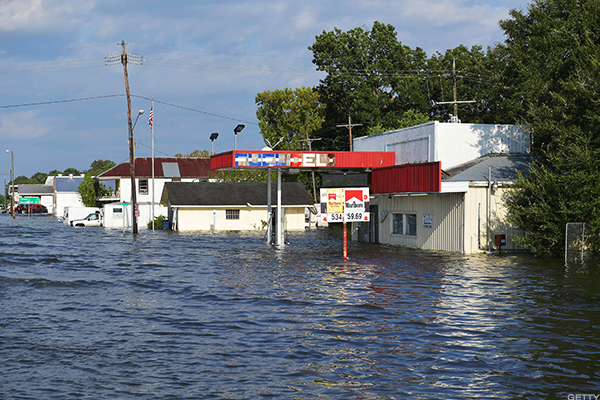 Hurricane Katrina caused about $50 billion in insured losses. Billionaire investor Warren Buffet of Berkshire Hathaway (BRK.A - Get Report) (BRK.B - Get Report) said there will be a lot of uninsured loss. "It has a real effect. It destroys wealth. If there's $150 billion or something of uninsured losses, that's real wealth," Buffett said in an interview with CNBC's Becky Quick. Weather analytics company AccuWeather has reached the high end for most estimates, suggesting Harvey damage costs could reach $160 billion. That would earn Harvey the title of the costliest storm ever in the U.S.
Goldman Sachs predicted "property damages in the range of $30 billion," and a reduction in third quarter GDP of as much as 0.2 percentage points dragged down largely by energy sector disruptions. Goldman said Harvey has likely shut down about 16% of the nation's oil refining capacity. Gasoline futures jumped to a more-than-two-year high on Thursday after Motiva Enterprises said its Port Arthur refinery would be offline for as long as two weeks. By Tuesday morning, gasoline futures were trading down, losing $5.29, or 3%, to trade at $169.50. The lack of refinery capacity has significantly reduced the U.S.'s demand for crude oil. An increase in crude futures earlier last week could be a result of traders hedging bets that prices will fall. There are 3 million to 4 million fewer barrels per day demanded in the U.S. currently, Oil Price Information Service told CNBC. 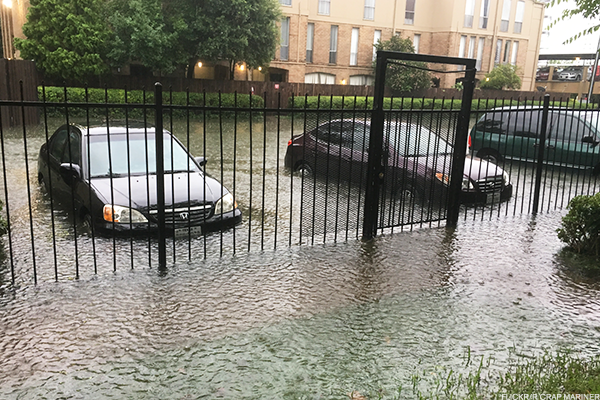 Analysts have suggested that Harvey could destroy more cars than any other storm in U.S. history. Black Book automotive data firm said up to 1 million cars in Harvey's path were ruined. Evercore ISI said about one in seven cars in the Houston area were destroyed. More modest estimates from Cox Automotive put total destroyed cars between 300,000 and 500,000. Cox estimated Sandy wrecked 250,000 cars and Katrina took 200,000. Auto sales will also take a hit. Texas is the second-largest market for auto sales in the country, and the Houston area rocked by Harvey represents 30% to 40% of Texas sales, according to Barclays. Texas is the largest market for trucks in the U.S., so an uptick in sales of models such as the General Motors (GM - Get Report) Chevrolet Silverado, Ford Motors (F - Get Report) F-series and Fiat Chrysler (FCAU - Get Report) Dodge Ram will likely start in the coming months. 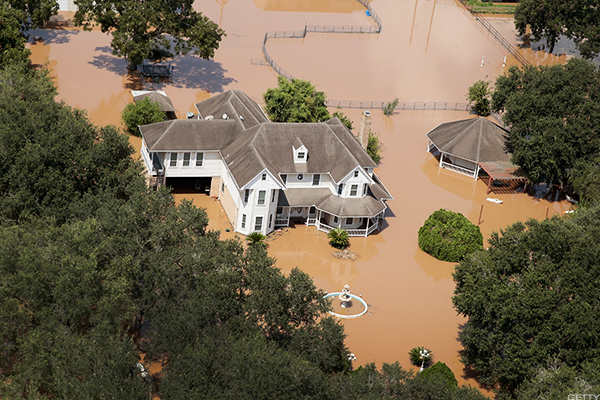 Here's what to do after a flood.